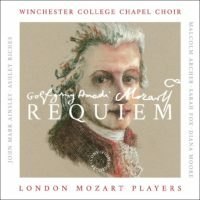 The origins of our latest recording with Winchester college chapel choir. Performing Mozart’s Requiem at my secondary school was one of the highlights of my musical education. Unfortunately, it’s something few teenagers have the opportunity to experience. I loved the extremity of emotional expression in the music. From the furious paced Kyrie, to the haunting Lacrimosa and the sublime Lux Aeterna. At that time, I had no idea I’d go on to establish Convivium Records a decade later. This has provided the opportunity to work with some of the most outstanding artists in the country to produce a new album of this masterpiece. The project began with a casual conversation over dinner with the organist, composer and choral director, Malcolm Archer. We began to discuss the possibilities of future projects with Winchester College Chapel Choir. Convivium Records has released multiple recordings with them and the feeling was that we needed to aspire to something exceptional. When Mozart’s Requiem came up, it seemed immediately to be a natural work for consideration. It was decided that collaboration with the London Mozart Players and some world-class soloists (Sarah Fox, Diana Moore, John Mark Ainsley & Ashley Riches) would be a worthwhile investment, given the professional standard of the choir. The London Mozart Players and Convivium Records share a vision of working with young musicians, recognising that not only are they equipped at an early age to perform at a professional level, but that they are also the future of our industry. For the choir, singing with the orchestra is probably something they will never forget and it was excellent to see a number of the older boys sitting in silence, observing the sessions with soloists and, perhaps, considering their own musical futures filled with potential.